In today’s fast-paced environment and with all the mounting work, social activities and household chores, we rarely get the chance to spend quality time with our children. To compensate for this, we tend to buy them new clothes, toys, tablets, anything what would divert their attention while we continue our busy routine. But can these material things can really compensate for quality time? Sadly, no. As parents, we need to realize the importance of spending quality time with our children. We need to be present in the important milestones of their lives. We need to cherish the time that they are still young and innocent because they grow up too fast. Spending more quality time with our children would not only be good for them but also beneficial in the long run. Family time is the perfect opportunity for our children to interact and develop his/her character. 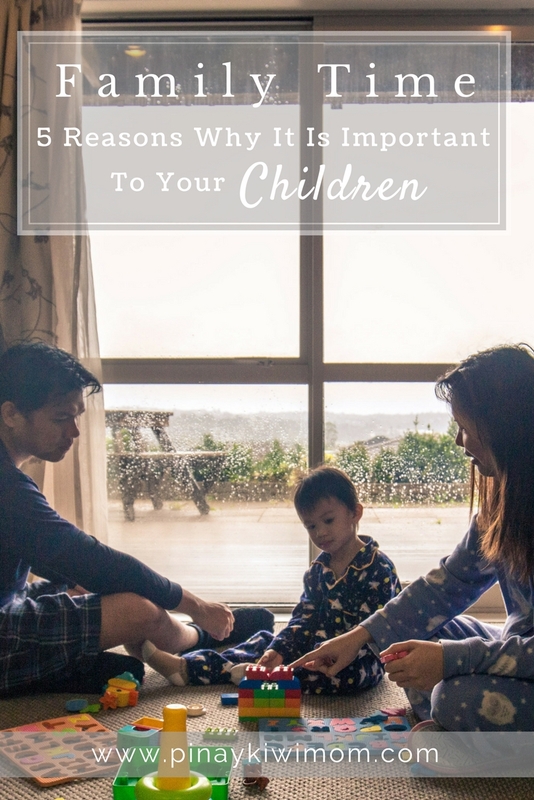 Below are the 5 reasons why family time is absolutely important for children. When children spend more time together with their parents help build up a positive sense of self-worth. When kids feel valued, they would feel more positive about themselves. Family time doesn’t need to be expensive. Activities such as picnics, camping out, eating together, sports or even playing games together. What matters most is the time you spend together and enjoying each other’s company. Developing a sense of belonging to our kids have huge benefits that stays with them throughout their lives and can lead to a happier child. Remember, it’s the quality of interaction that really counts. Spending more time together and sharing leisure activities strengthens the family bond. If you often find yourself busy with work, try to take a break and reconnect with your kids. Children would feel a sense of hesitation if they would find themselves being ignored most of the time. You can talk about your favorite hobbies, or likes and dislikes, outdoor games for exercise and recreation. The strengthening of family bond is one of the most important benefit of family time. Family time creates wonderful memories for both parents and kids. Children who grow up with happy memories will most likely create a loving environment when they'd have a family of their own. Kids do learn and grow up fast so don't miss out on the opportunity to know your children better. Spending time with your kids will most likely increase chance for success. When your kid grows up from a positive home, they will grow to their full potential. Remember, family stability is the key to academic success. Building relationships, seizing quality moments of connection, any time that you can give a child your undivided attention, you are making a lasting impression in their hearts. A memory to last a lifetime. Can you suggest other reasons why family time is important? I’d love to hear your insights in the comment section below!